NS Recipes comes with its own image upload manager. Learn more about it here. To keep things simple, this upload system is the only one available for NS Recipes 3.x versions and above. Simple file uploads will be used regardless of Image Upload settings. Toggle Resizing. Our advice is to keep it set to "No," because NS Recipes can generate thumbnails. Creating thumbnails from a good quality image produces nice results. 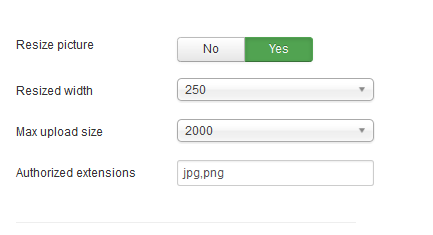 If previous option is set to yes, then NS Recipes will resize the upload picture to the specific width. Proportion is kept intact. A comma separated list of extensions, with no spaces. Case insensitive. Recommendation: You should avoid .gif uploads. Prior 3.5. versions, NS Recipes came with several upload systems: Joomla native file upload, SWF Upload, Drag n Drop & Simple file upload. They allow your users to upload recipe pictures when submitting recipes from the front-end. This file upload system relies on Joomla image uploads. SWF Upload is a flash-based upload system. It allows instant picture resizing. Does not work on apple devices. Tip: If you decide to use SWF Upload, NS Recipes will detect apple users and recommend the default Joomla upload system instead. Known limitation: SWF Upload does not work if the sh404SEF component is installed. Based on mootools, this elegant upload system makes it possible to drag a picture in an area. Pictures are not resized.